In this article are collected and presented modern and elegant WordPress themes perfect for wedding websites. Most of these themes are also suitable for personal, portfolio and gallery websites. The biggest part of these represented themes are responsive, retina-ready WordPress wedding themes designed for couples who want a beautiful website to celebrate their wedding day or any website that needs a romantic touch. Color schemes in these themes also have separate background textures, so you can choose the combination that works perfectly for you. It is important to highlight that all of the presenting WordPress wedding themes have a social media tool so inviting your guest will be so easy as you do not think that it could be. After the decision to invite guests to your important celebration in a modern and innovative way, let’s get the most attractive WordPress design to you! Here is a list of different functionality and outfit themes as well. Wedding is a simple and attractive WordPress wedding theme and was created for this one a responsive layout to make it look better on all devices including mobiles. The design is a minimal one with nice simple colors and custom web fonts to match the wedding event. That provided with the theme a custom admin panel from where you can easily edit the main settings, change colors, modify the layout. Set up this and use for the exciting your life event! Marriage is a simple and attractive WordPress wedding theme. With this theme, you can easily create a wedding related website, but you can also use it for other purposes too, everything is flexible and easy to customize. It is suitable for users with zero programming skills as well as advanced developers. The theme is the perfect match for your wedding with predefined styles, drag and drop builder and beautiful design. 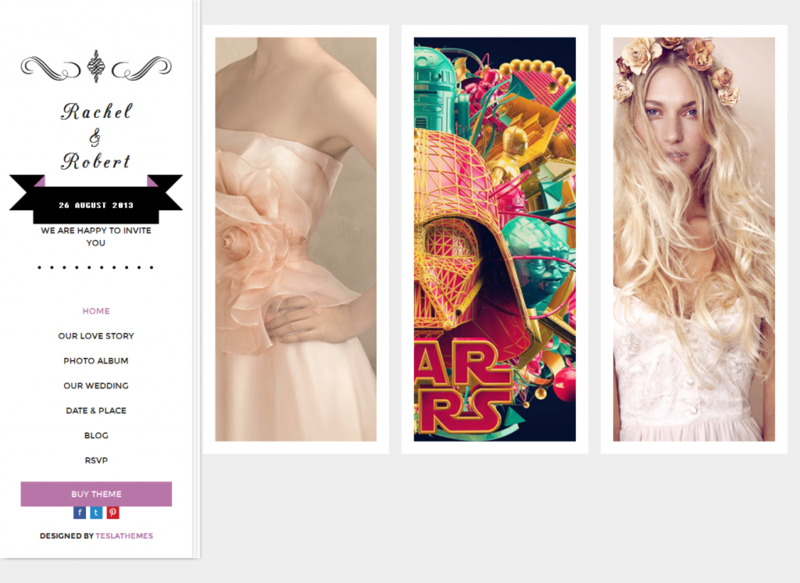 GeekLove is an elegant and beautifully hand crafted responsive HTML WordPress wedding theme. This template is powered by the latest WordPress technologies and making it a breeze to create any kind of layout you desire. This WordPress wedding theme features a simple to use RSVP form, smooth scrolling, lightbox photo gallery, retina ready images, Google Fonts integration and much more. Moreno is a WordPress wedding theme which fits full screen and is simple and functional one. It’s super simple. It has a responsive design meaning your content will be displayed beautifully on all mobile devices. Moreno is a modern and elegant WordPress theme perfect for wedding websites. 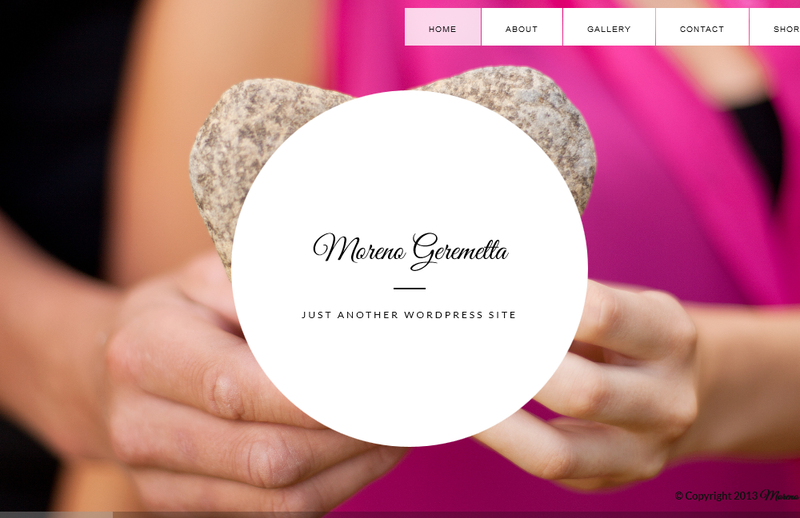 This theme also suitable for personal, portfolio and gallery websites. Vintage is a responsive layout WordPress wedding theme with fluid grid system that adapts any viewing environment (mobile/tablet or desktop). It has 10 page templates (Filterable Photo Albums Gallery, Blog (full posts), Blog Excerpt (summary), Content + Sidebar Right, Content Half Page + Sidebar Right Half Page, Full Width Page (no sidebar), Landing Page (no menu), Sidebar Left + Content, Sidebar Left Half Page + Content Half Page and Sitemap) and 12 widget areas. This theme is search engine friendly, W3C markup validated, well documented. 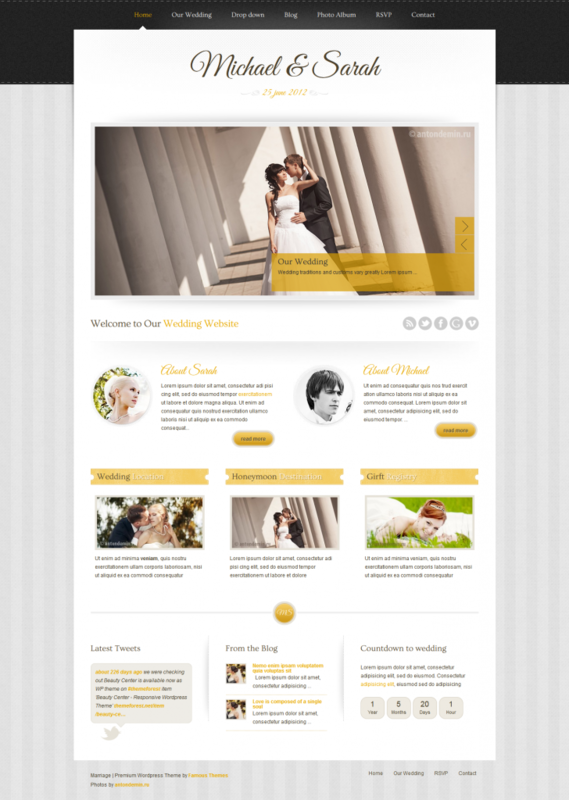 The Wedding is a responsive WordPress wedding theme for those who are planning on getting married. 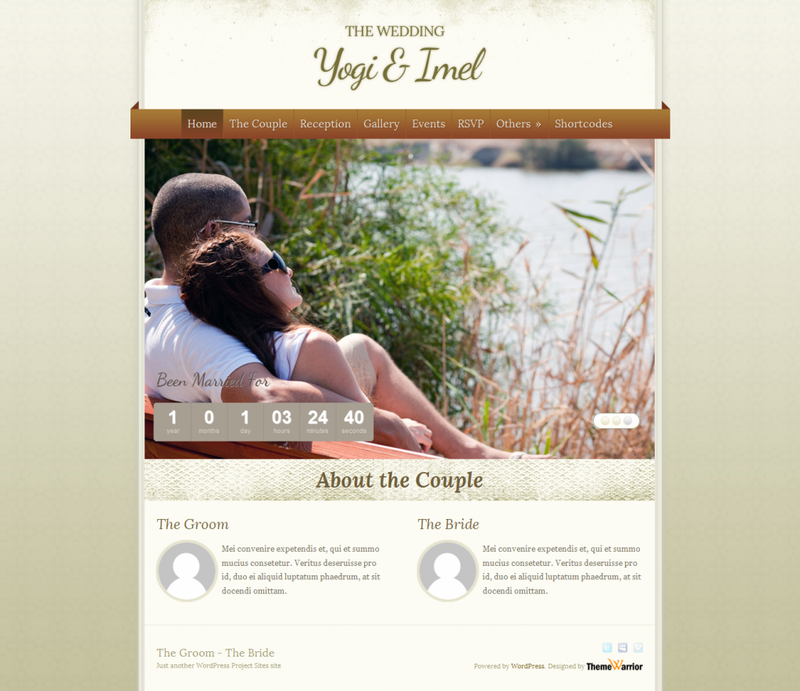 Don’t forget to setup your wedding site using The Wedding WordPress theme. The Wedding features an elegant and classy look to give your wedding site an outstanding look. All the features that contains this WordPress wedding theme let you to prepare for your event fully. Wedding Album is a simple and compact-structured WordPress wedding them. This theme could be the best present for your wife/husband, girlfriend/boyfriend, bride/fiancee, parents or even grandparents to congratulate them to an anniversary, wedding, birthday, etc. You can share with people the story of your love, the way to the happiness, to embody the way of your professional growth process, present your masterpieces and so one. Nice image galleries outputting, which can be provided with calm music, ability to add video in slides keep your visitors definitely satisfied and impressed. That is also a good decision for professional photographers to showcase their works. Wedding Day is a functional and attractive WordPress wedding theme made for inviting to your fabulous evening. 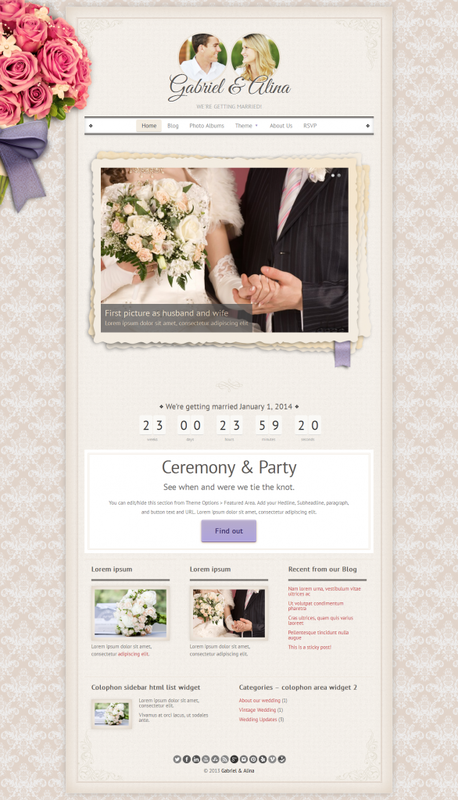 Wedding Day can be used as a wedding site, blog or creative template. Additional pages can be easily created with the existing elements, there are predefined pages already created. As a new technologies is requiring – it is responsive as well. Whether you‘re displaying on desktops, tablet, mobiles, your work, your images, your products will always look the same. Heart is a single page Concrete5 wedding theme with two page types and custom blocks. Colors of this WordPress wedding theme for background can be customized. This theme contains one page responsive design, custom blocks, two page types (home and wide pages), editable colors and more. It’s clean and beautiful– everything you need for a nice wedding website for guests inviting and your love story sharing. Gittys is an awesome WordPress wedding theme which is super simple. It has a responsive design meaning your content will be displayed beautifully on all mobile devices. It’s easy to navigate and promotes a feeling of visitors satisfaction. The well organized menus and page structures encourage a positive user experience allowing your visitors to find what they’re looking or you would like to show them for quickly. This theme contains BuddyPress as well. If you’re not familiar with BuddyPress, it’s a social network plugin for WordPress allowing your website to become a fully functional community portal. BuddyPress lets your users interract through groups, forums, friends, status updates, private messaging and a lot more.